Seriously one of the most memorable commercials (and toys!) of our childhood. Crash, bang, smash 'em up! 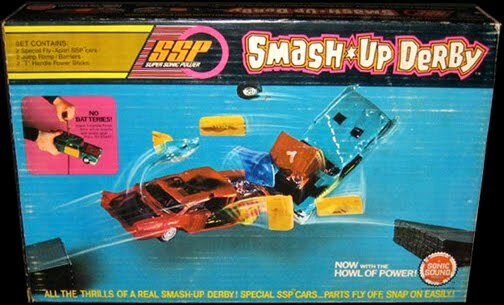 Smash Up Derby is FUN! Check out the slightly hillbillyish voice on the announcer, plus, if ever a FONT could look hillbilly-like, the one they use in this ad is. Man, they just don't give kids toys and tell them to smash them up these days, and we are a sadder, poorer nation for it. This page has some great art and really fond memories of the Smash-Up Derby. I never could get those zip cords to work that you used to start those toy cars of the era!